Anyone have any experience with Sherline's 5800 mill or opinions on it over the 5400? I am about to get a full workshop from them but am undecided about the mill selection. I feel like the larger working area of the 5800 would be great but to my, admittedly untrained, eye it looks less rigid than the 5400 and seems like it would be prone to moving out of tram and deflecting a lot. Would appreciate any thoughts you might have on these 2 mills. Also I am curious if anyone has any suggestions on the full workshop packages that Sherline provides; are they a good deal? Should I build my own package (i.e is there tools in the package that I should just avoid etc). I like that I can get the basics all up front but if there is a better way to put this together I would like to know. Wow, over 2K for a Sherline mill!!! It has extended range and is similar to the 2000 with regard to the head adjustments but I cannot imagine a Sherline mill costing that much. I own a 5400 mill; got it maybe 25 years ago. It is a very capable mill, especially since I added the 15" column, column riser and headstock riser. It has done all I asked of it and maybe a bit more. In my opinion, what Sherline is doing with this 5800 mill is trying to expand the envelope of the machine without significantly improving the rigidity. Personally, I would opt for a PM25MV before I invested 2K in that machine: http://www.precisionmatthews.com/shop/pm-25mv/. Or perhaps consider buying the 5400 and upgrading the column to give you more headroom if your work is going to be limited to the smaller stuff. Do not underestimate the 5400. It is a very capable little mill, but it is little and can only handle little stuff. Still, it will do everything that a bigger mill will do within its envelope and it will do it with precision. On the off chance that you go with a Sherine mill, I think you would be better off without the package. Buy a better keyless chuck, like a 3/8" Rohm Supra and buy an adapter from Sherline for it. Also buy a good 2" screwless vise (an import will work fine); it will be more accurate and rigid than the aluminum Sherline vise. You will need a flycutter but buy the 7620 inserted carbide one; it is world's better. Save the clamping set for when you really need it; the vast majority of work can be held in the vise. I think a tooling plate is a wise investment and mine lives permanently on my table. You can buy spotting drills instead of center drills and they will work better for starting holes. Sherline end mills tend to be good quality but are expensive for what they are. You can get better on ebay; ask the guys for recommendations. For tool holding, one of the best options you can get is a Beall ER32 chuck to fit the Sherline spindle. It comes with an import collet set but it is enough to get you cutting. I would not bother with Sherline's end mill holders; make your own if you want them but with an ER32 collet chuck you won't really need them at all. The books that come with the set are reprints of the instructions found on their website so I wouldn't let that influence me. 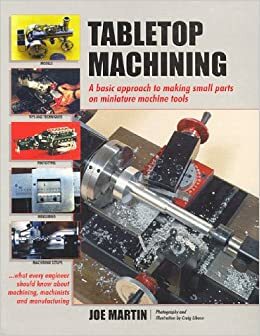 However, you should by Joe Martin's book, Tabletop Machining. It is an excellent primer that showcases Sherline equipment. I love Sherline equipment. In the micro-machine line, I think they are the best out there (sorry Taig guys!). Their accessories tend to be high quality, work well and cost less than other small machine tool makers. I particularly like the 4400 long bed lathe and I think this is the best small precision lathe on the market in its size class. BUT this applies only if your work envelope is appropriate for these machines. If you need to or may need to go bigger, now is the time to go bigger. I suggest you think on this, ask more questions here and then decide if these machines are appropriate for your needs. I own them, I love them, but I also own larger machines for when the need arises. I have a Sherline mill and lathe. I have pushed both above their limits. My lathe head is now my toolpost grinder for my real lathe. I agree with Mikey. Unless you are only doing small precision model work in the foreseeable future look at a larger machine from PM. Everything depends on what you are going to do with the mill. It should be clear that Sherline makes miniature mills and lathes. Can pick up the entire mill with one hand. It is not a bad thing it is what it is. They are quality for what they do, miniature parts. Some people do only that and it is fine, others would like to make larger things and "Outgrow" the Sherline miniature tools. For the cost of new Sherline machines I would agree with mikey to look at the precisionmatthews machine. Because that machine can ALSO DO any miniature part you want to make but do more life size type things too. I wanted to add some perspective on the Sherline mill. If you can bolt it down or clamp it in a vise then the Sherline mill will cut it. You have to take lighter cuts because the mill is not as rigid as larger machines but it will cut just as well and just as accurately as a larger mill. Although it excels for very small parts, I have done comparatively large parts with this mill and did just fine. So, how big is big or how small is small? I've cut 5" discs out on the rotary table, no problem. I've squared and profiled/slotted numerous pieces up to 6" across. As long as I can clamp or lock it down on the table, I can cut it with the Sherline mill. I've bored out to 3", although that is pushing the envelope on this mill. Quite honestly, I got along with the Sherline mill for decades and only stepped up to a larger mill maybe 5-7 years ago. The larger mill is capable of larger work but not better work. It is faster but not any more precise. So, if your work is on the smaller side then a Sherline mill will work for you, but not for 2K. For 2K, there are better deals that will also do small work, as Cadillac said. I'm going to stick with the 5400 mill as I think, Mike, you kind of confirmed my suspicions. I was also looking at larger mills for the same price. As you pointed out you can get a larger machine for the practically the same amount. My problem is space; I live inner city and in a relatively small apartment so space is at a premium. At this time and I think the 5400 is a good size for my needs. My work is going to be limited to smaller stuff for now and I'm fine with that. I also appreciate your feedback on the package deal. I've been in contact with Sherline's sales department asking about getting the package with the mill upgraded with their new ball screws but will probably scale that back to just what I need from them and source the other tooling as you suggested. Again thanks everyone for your help! It might be a nice idea to get it with ball screws and ask them to be sure it is CNC ready. They do sell the mill "CNC ready." That way you can easily add the CNC kit to it. Without ball screws it is a bigger deal to go to CNC. CNC requires ball screws. This is small, square-shaped head that is of much higher quality and very accurate. It requires an adapter with in internal 3/4-16 female thread to fit the spindle and an external 7/8-20 thread to fit the boring head. Little Machine Shop used to sell this adapter but they may no longer carry it. If you cannot find it, you'll have to make it. The ebay item is priced way too high but if you are patient, a good one will turn up. Most ebay heads will be B-type head that takes 1/2" bars - too much weight to be swinging around. The A-head that takes 3/8" tooling is better. The other thing I wanted to mention is that in order to maximize your work envelope, consider buying the 15" extended column, the column riser and the headstock riser. These will give you more room under the head for taller work. It will also give you more room in Y and you will need every inch of it. Otherwise, if you have questions, ask. Adam, what are your plans for a lathe? I understand space is limited but you NEED a lathe as much or more than a milling machine. In a job shop, the mill does 75+% of the work but in a hobby shop, the lathe is used much more. For me, I would rather have a lathe and do without the mill than the other way around. On the off chance that this is on your radar, take a hard look at the 4400 long bed lathe. If your work falls inside the work envelope of this lathe then I can highly recommend it. For its size, it is powerful and very, very accurate. With a lathe and mill, you can make many of the accessories you need for hobby machining and this adds to the joy and functionality of the hobby. Not many machines with this capability can be stored in the hallway closet, trust me. Mike, I will be getting the 4400 lathe as well. I didn't really have any question in my head about this one so that's why I was mostly asking about the mill. Since you bring it up though; any things I should consider for the lathe? I'm really starting to consider not getting a "package" but just buying the lathe and mill and a few accessories that I think are worth it from Sherline but sourcing some better stuff like you said (e,g the drill chuck). Do you know if there is anything that I should definitely add to my order from Sherline that would be hard to source? For example, I would like to get a 4 jaw independent chuck for the lathe... should I just get this from Sherline or can I do better? My concern is finding tooling that fits the lathe (maybe that's not that hard and I'm just over thinking it). Also, any opinion on inserted tooling on for the lathe? I have been hearing that, while it can work, it is not superior and you can't really take advantage of it on such a small machine but I have seen many people using it without complaint and getting great results. My attraction to inserted tooling is not having to grind my own tools (which is another space, mess, machine concern for my little work area). I'm not so worried about the cost factor but the usability factor; which would add the most value. Any thoughts? Thanks a lot for your help with this. I really appreciate it! That book by Joe Martin that Mikey mentioned is worth getting. Maybe ask Sherline if they have a copy to sell you. Good machining advise for beginners. For example don’t buy a set of taps because the quality is low, buy what you need as you go. And the interesting story of how he got involved in Sherline and grew the business. Wow, I just looked at the 5800 mill. I can’t believe it’s over $2K! Has somebody lost the value of a dollar? I would make my dollar go a lot farther with better quality machinery. Glad you're considering the 4400, Adam. I'll be honest and say that when my work piece drops below 1" OD, I prefer to work on the Sherline lathe. My lathe is outfitted with a VS DC Leeson motor hooked up to the leadscrew when I need it. This allows me to vary both speed and feed to precisely dial in a cut; it is, without a doubt, the ideal set up for a Sherline lathe. 3", 3JC - buy the Sherline version. Very high quality, very accurate. Follow rest (not as important but necessary for some long work). Live center. Make a better one later. MT0 drill chuck adaptor that allow you to use a 3/8" keyless chuck. Albrechts are the best but a cheaper Rohm Supra is fine. I own two Rohm chucks and two Albrechts for my Sherline and all work about the same. I also have the Sherline keyed chuck; its good but the keyless is better. Beall ER32 chuck - fits both lathe and mill. There will come a time when you use gravers and this chuck will save your knuckles, believe me. Pretty accurate, too. Buy an OXA quick change tool post. Sherline's rocker tool post is okay but slow to use. Too bad A2Z went out of business; they made a good one. Might find a used on on ebay. Otherwise, import is the only realistic choice. Aloris makes a mini-tool post that fits the Sherline lathe but the cost will make you weep. Threading attachment - this is a critical piece of equipment that will allow you to cut almost any thread you can possibly use. It can cut class 3 threads, both internal and external, and I would not do without this accessory. A good dial indicator to dial work in on the 4JC. You can make a indicator holder to screw onto your cross slide or tool post. That's all I can think of as vital but I may come edit this later. Sherline can almost go fast enough to actually make you like these tools. If you want to go with re-sharpenable HSS inserts then AR Warner is the way to go: http://www.arwarnerco.com/p-12-kit-8-38-inch-turning-c-right-hand-left-hand-and-boring-bar.aspx; I own these tools and can tell you that they are fine tools and work well. The inserts cost a lot but they can be sharpened by honing the tops. No chip breakers so they cut with lower cutting forces. Ideally, you want to use shop-ground 3/8" HSS tooling on this lathe. A good general purpose turning tool will easily outperform either of the inserted tools linked to above. We recently had a very good discussion on this topic here: https://www.hobby-machinist.com/threads/models-for-grinding-hss-lathe-tools.62111/. I encourage you to learn to grind tools. It is a skill so it can be learned, and the benefits far outweigh the hassle or expense to get started. I own inserted carbide AND inserted HSS tools and they sit in a drawer. Give it some thought. This will get you started, Adam. There are tools that you can make to expand on the capabilities of this lathe. Check the Sherline section of the forum for ideas. If you get stuck, post or you can PM me, too. I asked essentially the same questions when I bought my lathe (4400) and again when I bought my mill (5400 with extended column). I'm on the small side of what the Sherlines can do so a larger machine wasn't even a consideration for me, just Sherline, Taig or Chinese mini lathe / mill. I've been very happy with my choice, it is very clear Sherline puts a lot of care into the assembly of their tools. What my experience was after looking at buying things individually or as a package, the Lathe packages are pretty solid, I went with the C package which is quite extensive and a great deal, I think I figured out you get the tooling for like 50% of the individual price. I've added a few more things I may use but I got everything I needed with the C package. The mill package I found it made more sense to buy the mill alone, too many things were included that I either didn't need right away, duplicated items I got in the lathe package, or was advised I would want to replace with something other than what Sherline offers. I bought the lathe and mill individually a year apart, so I'm not really familiar with the specific combination lathe / mill deals. I also went with the baseline, no DRO or CNC ready. One of the other things is keep an eye on Ebay, I have a constant watch and email for stuff posed for Sherline. Got the rotary table for 1/3 of the price and do not think the person ever used it. I have got other tools as well. Like mikey I often revert to the sherline for small items. Well, I think I am just going to get the CNC package with the ball screw upgrade. I will be adding the other tooling you guys have suggested as I go. I was doing some pricing and it really isn't any cheaper to just mix and match what you want vs just getting the package and adding a few items. These are the "bootstrap" items I plan on getting. Things like a better boring head will come later. I am also going to pass on inserted tooling until I've had some experience to actually make a decision about its usefulness for myself since I hear mostly that ground HSS won't steer me wrong to start with. Anyone see anything out of whack? Just a suggestion but I would spring for a wedge-type QCTP from LMS instead of the Sherline one, reason being the cost of additional tool holders. Sherline tool holders are $68.00 each, while LMS 000 holders or other 000 holders will be a bit over $10.00 each and they will all work the same. Sherlines post is nice but not nice enough to warrant the cost. For a drill chuck, I suggest a 3/8" chuck instead of 1/2". The tailstock taper won't handle huge drills anyway. You MUST have the threading attachment, please take my word for this. Overall, I think the package is okay otherwise. I would include a column riser, though. This will raise the milling column up so that a 2" vise will pass under the bottom of the column and give you more room in Y.
I'll add the threading attachment. I was kind of hoping to get into using a stepper to drive the spindle and do threading with CNC but that might be jumping the gun and I will probably be better off (or having more success with) doing things manually to start with. I'm in this limbo ground on CNC; I love the automation aspects of it (I'm a software developer by day so this hits me in the feels) but I am also really interested in manual techniques as well. I kind of planned on using the CNC in MDI for some pseudo power feed at first. Either way, I will take your advice to heart. Do you mean a 3/8 maximum capacity chuck? I went 1/2" because that was the largest they had for 3/8 mount. If this is too big I'll scale back to 3/8 capacity. Wasn't sure about the riser since I was going to shoot for the extended column but you bring up a good point. Any thoughts on the extended headstock spacer? The package comes with a 1-1/4" spacer but they also have a 2-1/2" spacer available wondering if this is worthwhile or if you've used it before. It amazes me what CNC machines and their operators can do with them. However, I agree with your thoughts about learning to manually machine first. This will teach you about how metal likes to be cut. There is a sound, a feel, a touch to working metal manually that you will not get by starting with CNC. If something goes wrong, you will know it but more importantly, you will know how to fix it. It sounds like you're the ideal guy to go CNC, though. Yes, I mean a 3/8" capacity chuck. Remember that on the lathe, you only have a MT0 taper that is not locked into the tailstock taper by a drawbar. You can use 1/2" drills but you'll have to step drill up to it most of the time because the taper won't hold that large a drill, even if the chuck will. I usually drill up to 3/8" and if I have to go larger then I either carefully step drill it or bore it. I have reduced shank drills up to 1/2". I have the extended column on a column riser to max out room in Y. I also have the 1-1/4" headstock riser to give me more room in Y. The former mods allow my vises to get under the column and the latter gets me over the vise with the table in near mid-position. I think all three mods are important to have on a 5400 mill. I also have the rotary column thing that lets you tilt the entire column side to side. I thought I would need it someday but I've never used it. Like the adjustable ram thing on the 2000 mill, potential for movement of a mill head or column is not a good thing. The more rigid and solid you can get things, the better. You are going to love your machines, Adam. Everything these machines teach you transfers to larger machines so if you step up to a larger lathe or mill someday, you will be ready. Yup the book is on the list as well. Any other reading material recommendations? You will probably want to get yourself a Machinery's Handbook. It doesn't need to be the latest version, there is a big savings in getting an older edition. I found the guide that goes with it handy. I also got myself a copy of the Engineer's Black book which is very handy. It distills much of the more common info in the Machinery's Handbook into a more easily grasped format. Machinery's is kind of like reading an encyclopedia, the EBB is meant to be a quick reference. You mentioned getting ball screws and a "CNC ready" configuration above, which sounded like you might be planning on going manual to begin with and then installing CNC later. Generally ball screws are going to require CNC control. I would verify that with Sherline directly whether you can just use it until CNC put on. I think it would be ok as long as the non moving axis was locked down like it should be anyway. I use both in an apartment, just keep your work bench away from wall and put fairly thick rubber pads under your work bench. Also might want to look at making a swarf containment system.